I've never tried Illamasqua Nail Varnishes before, and I was eager to try them out. I managed to get Jan, the gorgeous pastel powder pink, and Elope, a bright - yet deep - leaf green. As soon as I got these I was so excited to try them out. Look below the swatches for what I thought of them! My favourite one was Jan, it applied effortlessly, and really did deliver amazing colour with the '2 coats' it claims. 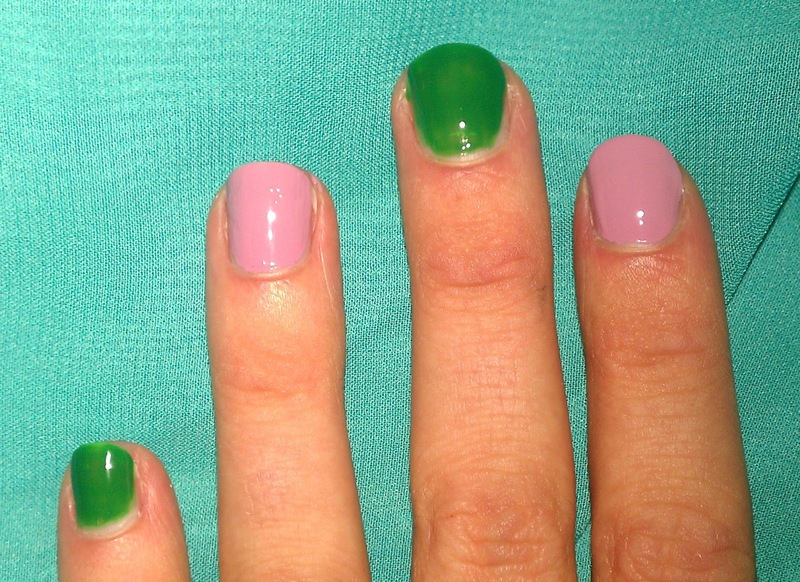 I love how this powdery pink looks on my nails, so girly and very Spring! This nail varnish made me very excited to try Elope. 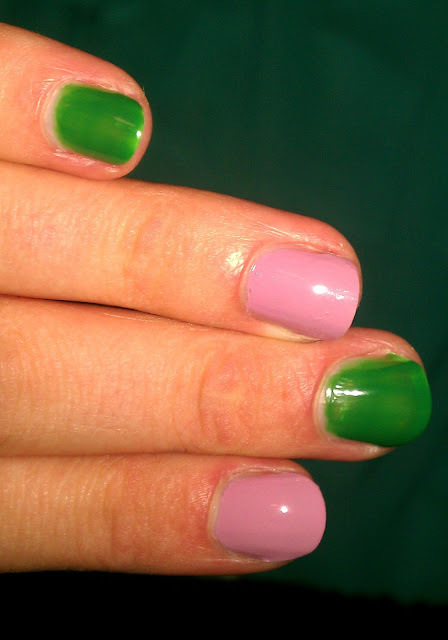 Elope was a let down for me, as you can see, you can still see the tips of my nails - This was after 3 coats too. I couldn't be bothered for more coats to be honest as I really wasn't getting on with this shade, however it did look nice over a white polish base. I was very surprised as Jan went on my nails like a dream. I found Jan way more creamier to apply in contrast with the more watery consistency of Elope. I'm gutted about Elope and it put me off buying other nail varnishes from them, even though Jan was such a pleasure to put on my nails. These babies dried so quick, within 5 minutes I walked out of my flat and to uni. These also took a lot of beating to them and didn't chip for a few days, so I was very happy with that. You can still get the shade Elope from Debenhams here for £13.50 if you want to give it a try, but I wouldn't recommend this personally. In comparision with OPI which are usually £11, I found that OPI had no competition with Illamasqua Nail Varnishes. However Jan is a colour I would tell everyone about, but is discontinued after being part of their Core Collection, but still found occasionally online. Let me know if you've tried Illamasqua Nail Varnishes as I'm curious to how other shades work. Thanks for reading!